BigCommerce Standard or Enterprise Plan? The BigCommerce shopping cart continues to be one of the leading eCommerce platforms on the market today. To accommodate both small and large businesses as well as those in between, BigCommerce has created an array of eCommerce hosting plans. This includes their Silver, Gold and Platinum packages. Everything needed to set-up, maintain, and manage an online store comes with each package. This includes a website with your choice of templates along with the opportunity to sell an unlimited number of products. And hosting services with speedy load times are also a part of every BigCommerce package. One big difference, from a business owner’s perspective, in these plan options is of course the price. The other is the varied levels of tools and features for online sales. Although the Gold is the most common plan purchased, new start-ups often opt for the Silver because it’s the most economical package. Larger and more established businesses may want to customize or integrate the shopping cart with another website. This will sometimes require the need for added technical support which is included in BigCommerce’s Platinum package. The Platinum package is also best for stores with high traffic and large volumes of product images to load. In most cases, one of the above packages will suffice for your business. However, quickly growing brands may need a little more. Still user-friendly, BigCommerce has launched an Enterprise Plan suitable for large conglomerates with multiple websites or product lines. “What do I get with BigCommerce Enterprise?” is a question you are probably asking. Whereas the features of the standard plans are plainly listed on BigCommerce’s website, Enterprise features are not plainly stated. “White Glove” level data migration service. The Platinum pricing plan includes data migration service (migrating product, customer, and sales data from on platform over to the BigCommerce platform), and this is a pretty great service. However, this migration is limited to some specific eCommerce platforms such as Magento, Shopify, and the like. With Enterprise, BigCommerce will migrate data from any eCommerce platform – even fully custom ones. Dedicated and Priority service. Enterprise customers always receive 24/7 priority service. You also have a dedicated representative who can assist you with business strategies, support, and proactive assistance with your online business. High availability servers and uptime. The standard Silver, Gold, and Platinum plans are hosted on Amazon shared servers, which means that your site shares the server with many other sites. Long story short, shared hosting can leave your site susceptible to outages caused by traffic spikes on your website or any of the others that share your server space. Enterprise accounts are hosted on IBM High Availability servers, and are in effect dedicated servers. If you were to pay for a quality managed dedicated server, you’re looking at $1,000 or more every month – JUST FOR HOSTING. Product filtering. Product filtering is a feature that is only available on the Enterprise solution. Product filtering is a great way to allow customers to search and filter search results on the fly. You see this on Amazon.com for instance. Data compilation and statistics are important to the success of any business. 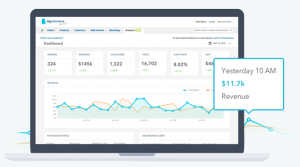 Consequently, BigCommerce has recently added a powerful analytic tool to the Enterprise Plan. Easy to understand, all of the information needed is in one place. This includes daily sales, orders and marketing stats as well as resources to help you know what products are hot with customers and which are not. Unlimited API calls, which is great to handle massive amounts of traffic. Custom integrations with your existing shipping, accounting, or inventory processes. Full PCI compliance, security and protection. Are established businesses with high traffic and revenue streams. Startups and new businesses who are experiencing rapid growth trajectories. Businesses that may see large spikes in traffic. Businesses with many products, as the Enterprise Plan offers even faster upload rates for images and data. Entrepreneurs seeking a more customized shopping cart. Businesses changing platforms and needing to migrate lots of products and images to BigCommerce. Large businesses looking for a do-it-yourself option. New entrepreneurs desiring expert help with marketing and search engine optimization. Customized ecommerce websites can be expensive to create. Along with the cost of experts such as web designers and developers, expenses related to updates and website maintenance will also adversely affect the bottom line. With BigCommerce’s Enterprise Plan however, customization is possible within their user-friendly platform, and updates are automatic. Further, with numerous apps and add-ons, you’ll have no problem expanding or adapting to your company’s growth. Signing up for the Enterprise Plan will further supply you with their White Glove service program which will help you move product, sales, and customer data from your current site as well as provide both you and your team with added technical support. Many users of the Enterprise Plan testify to an increase in sales and internet traffic. Perhaps this is due to the advice provided by the professional account manager assigned to each plan user. Additionally, you will receive advanced marketing tools to help you rank high within the search engines. One of the biggest factors in your decision in whether or not to go with BigCommerce’s Enterprise solution is the cost. As I mentioned earlier, you can expect to pay about $1,000 per month to run your site on the Enterprise platform. $12,000 per year may sound like a lot, but when put into perspective it may be a cost-saving and revenue-gaining move. Dedicated server. If you are running your site on a VPS or dedicated server, you may already be spending $300 to $2000 on hosting alone. BigCommerce’s Enterprise websites are hosted on dedicated IBM high performance servers. A dedicated expert. Your account includes a dedicated support rep. This is a specialist that you do not have to have on your own payroll. Hosting management. You do not have to tie up your own website or IT staff in hosting management. Let BigCommerce’s experts manage it. Increased conversion rates. 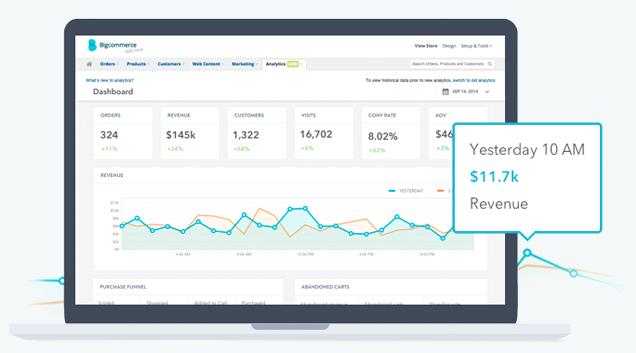 Enterprise customers report increases in overall traffic and conversion rates using BigCommerce Enterprise. This in itself may pay for the Enterprise cost. Increased security. High traffic eCommerce sites are targets for hackers who would like to highjack customer data and payment information. If your company currently uses in-house servers, VPS, or a dedicated server then there is a good chance that you are responsible for server and database security. The cost in manpower, downtime, and penalties for exposing sensitive data could be very high for your company. Let the dedicated specialists at IBM and BigCommerce handle this for you, and avoid potential disaster. Your team does not have to worry about applying software updates (if you have ever updated a Magento site, you will get this). Your team can focus on your business rather than learning new technologies in hosting and website development. I have clients who try to run their business, while at the same time managing their own website. It’s tough, and something will most likely fall through the cracks. The Enterprise plan may only fit a very small percentage of businesses out there. In most cases, your business might do just as well on the Bronze, Silver, or Gold plans. However, when the time comes that you’re ready to move up to Enterprise, the migration is fast and easy. According to BigCommerce, many customers start at the Bronze level and grow organically into Enterprise within a couple of years.